During Oswald Chambers’ years at the Bible Training College in London (1911–15), he often startled the students with things he said during his lectures. One young woman explained that because discussion was reserved for the following mealtime together, Chambers would frequently be bombarded with questions and objections. She recalled that Oswald would often simply smile and say, “Just leave it for now; it will come to you later.” He encouraged them to ponder the issues and allow God to reveal His truth to them. To ponder something is to concentrate and think deeply about it. After the events leading to the birth of Jesus in Bethlehem, followed by the appearance of angels and the shepherds who came to see the Messiah, “Mary treasured up all these things and pondered them in her heart” (Luke 2:19). New Testament scholar W. E. Vine said that ponder means “to throw together, confer, to put one thing with another in considering circumstances” (Expository Dictionary of New Testament Words). When we struggle to understand the meaning of what’s happening in our lives, we have Mary’s wonderful example of what it means to seek God and His wisdom. When we, like her, accept God’s leading in our lives, we have many new things about His loving guidance to treasure and ponder in our hearts. Father, guide us by Your Holy Spirit as we consider Your great love and embrace Your plan for our lives. 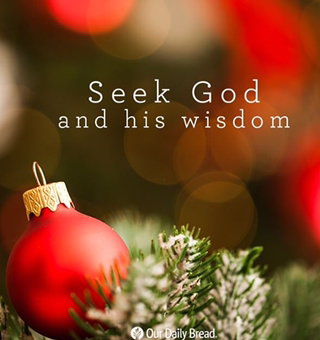 Allow yourself a few minutes of quiet during this busy season to sit and listen for what God might be saying to you. Shepherds were considered to be irreligious because their shepherding work prevented them from performing their religious obligations at the temple. Because they were in contact with dead animals, birds, and insects, they were rendered ceremonially “unclean” all the time (Leviticus 5:2–5; 11:4–43). It’s noteworthy that the birth of the Messiah—the Lamb of God (John 1:29) who is called our Good Shepherd (10:11)—was first announced to despised shepherds! A Sovereign God, Encouragement, For The Love of The Lord, God's View vs. World View, Guest Blogs, Living For God, What Is Truth? ← What will I do?